Apparently there are two types of coaches on Twitter. 1.) A coach that is just great on Twitter (great being a large blanket adjective that you can construe any way you want), yet just awful at actual coaching. Examples: Tim Brewster, Ron Zook. 2.) A coach that is just awful on Twitter, yet great at actual coaching. 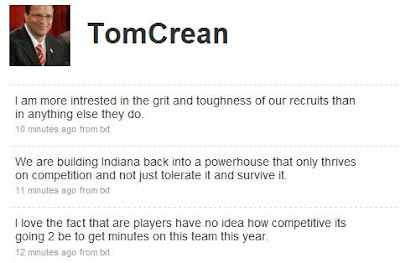 Example: Tom Crean. Not only does Coach Crean incorrectly use homonyms (are/our, your/you're) on a regular basis and forget modifiers (like... say... "not"), but he Tweets about reality TV. Brewster and Zook's Twits are pure comedy for several reasons (head to BHGP for the breakdown), yet Crean's just make me cringe. I realize Twitter isn't the place for the Grammar Police, but you have to step back and look at what you are putting out their [sic] for your recruits. Because we all know these Twitter accounts are nothing but "legal" forms of communication to potential college athletes. I am still dreading the day Lickliter and Ferentz are forced to open their Twitter accounts.